Lock in a great price for Sleepy Dragon Hostel – rated 9.2 by recent guests! The beds were spacious. The breakfast was amazing! The staff was very friendly!!! 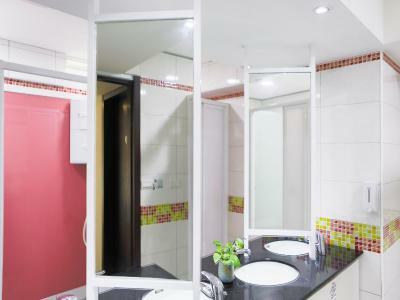 The location was pretty close to the subway (about 10 mins walk) and the bathroom was spacious and well-kept. The rooms are also very sound-proof, so I had no trouble sleeping at all! It feels like the staff put a lot of effort into keeping the guesthouse together. 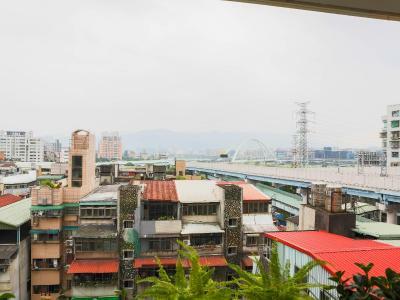 A added bonus was the fact that it was really close to the Raohe nightmarket and other attractions, like Tapei 101 and Sun Yat Sen Memorial Hall, are within a 30 mins walking distance (time to get in those steps!). 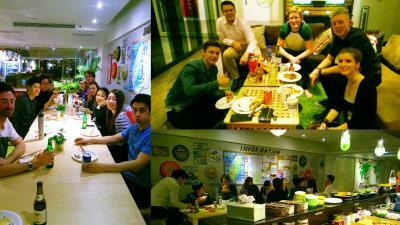 - The staff give you every useful information like where you should go and how to go there, what to eat etc. - The hotel located near 7/11 where you can grab anything you want 24-7. - Great ventilation in the dorm. - Freshly prepare breakfast just for you every morning. - The cabinet is large enough to keep my luggage. - The price is great!!! 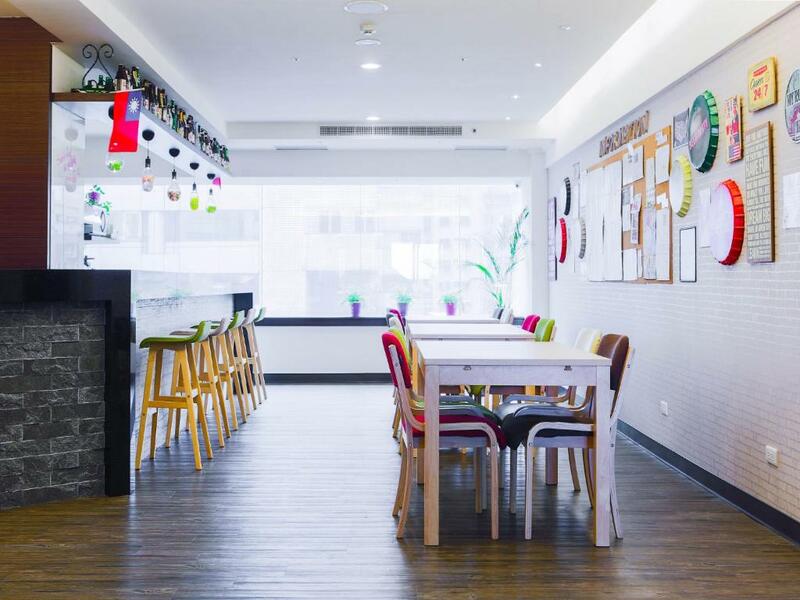 One of the best hostels in Taipei. Very welcoming atmosphere. Lots light and air. Rooms are quite roomy. Great common room. Very kind and accommodating host. Good location. The place is nice decoraye, very clean, comfort and near to mrt station. Breakfast was so good and the staff is nice. Everything! Breakfast is made for you! Wow! Different, fresh, made to order breakfast and tea/ coffee every morning! I've never experienced this in a hostel. Super clean. Fridge with drinks and another fridge to store your food. Able to cook your own food too. 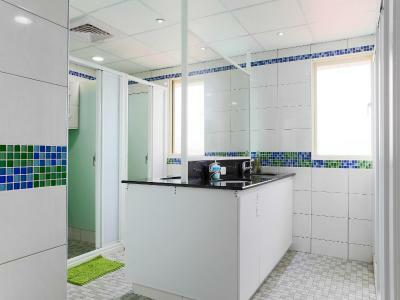 Only 4 rooms, and they have 4 Female showers and 4 toilets so there's never a wait. The rooms are huge and have big Windows. Also privacy curtains and closet that you use with your own lock. Really nice common area and the cutest cat. The owner is amazing and she really goes out of her way to make sure you are happy!! They have honestly thought of everything. About a 7 minute to closest subway. Love it!!! Cute, clean, friendly, GREAT big breakfast, good location, comfy bed! Staff are WONDERFUL and sooo helpful and friendly. Great place! By far the best hostel I have ever gone in. Satori (owner and receptionist) was very helpful; his wife shelley was also very warm and welcoming. This hostel went beyond my expectations, from the bunk beds, showers and toilets, kitchen area, sanitation and dining area. They also have this cool living room area wherein you can hangout and relax and perhaps make friends with fellow guests. 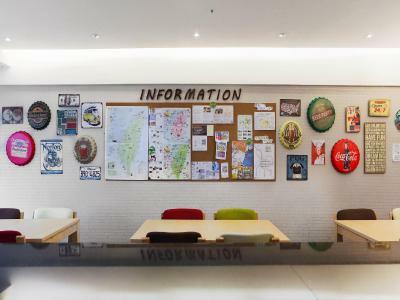 they also have this space where there are free snacks called "food sharing" some are donated by guests and some i presume are from the the hostel. they also have free green tea! Awesome aweseome place! definitely be back here for sure! I stayed here for a few days, As a world travelling vlogger/youtuber, I enjoy a comfortable environment with interesting people and good wifi. this one had it all. The beds are comfortable and they have lots of room in the lobby to relax and get some work done if you want. the breakfast is great too. Highly recommend! One of our best sellers in Taipei! 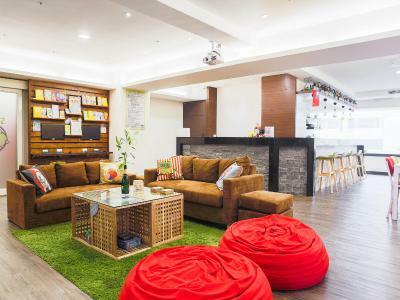 Sleepy Dragon Hostel offers homelike accommodations in Songshan District, a 7-minute walk from Nanjing Sanmin MRT Station. Free WiFi is available in all areas. 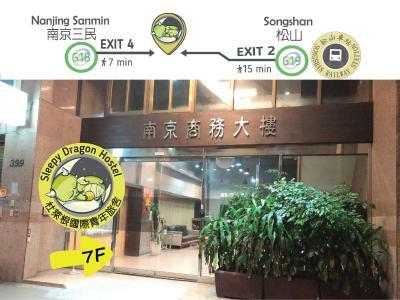 Sleepy Dragon Hostel is a 15-minute walk from Songshan Railway Station or Wufenpu Garment Wholesale Area. 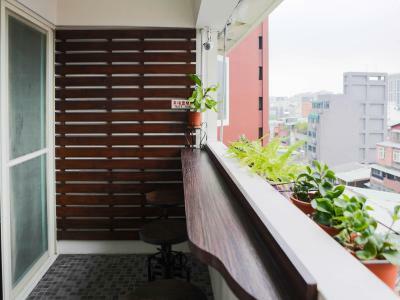 It is a 5-minute walk from Raohe Street Night Market, 0.9 mi from Songshan Cultural and Creative Park or Sun Yat-sen Historical Museum of History and 1.5 mi from Taipei 101. 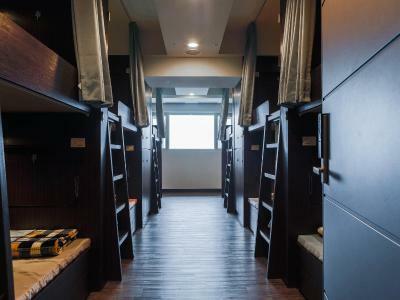 There are 4 dormitory rooms, each fitted with 12 beds. 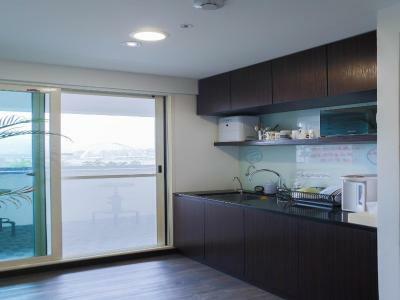 You can expect a view of the city or the mountains through the room window. 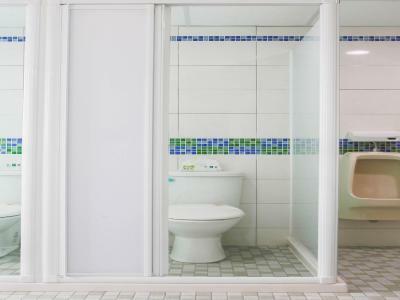 Each shared bathroom, being gender specific, has toilets and showers. The common area features a seating area where you can relax and enjoy a movie on the big screen. 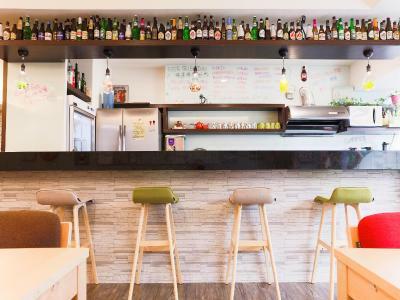 You can also find a shared kitchen and a stocked bar at this hostel. The front desk operates from 15:00 to 20:00. When would you like to stay at Sleepy Dragon Hostel? 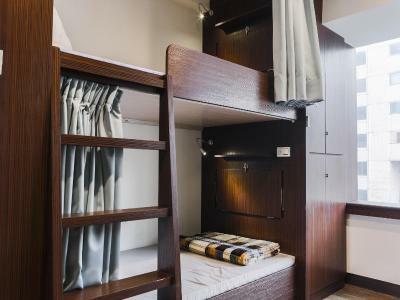 Each bed in the dormitory features a curtain partition to ensure privacy. You can find air conditioning, a desk, a reading lamp, and a power outlet in the dormitory. Power adapters are available. Room rate is for 1 single bed only. Please note that the front desk operates from 15:00 to 20:00. 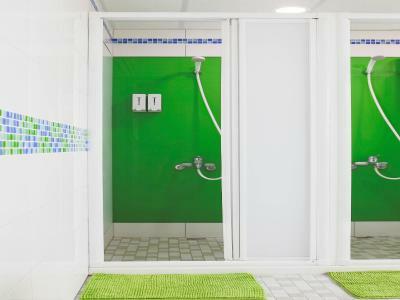 Guests who expect a later check-in than 20:00 are required to inform the hostel in advance. Room rate is for 1 single bed only. Male guests are not allowed in this room. Area Info – This neighborhood is a great choice for travelers interested in gourmet food, food and city trips – Check location Great location - show map Guests loved walking around the neighborhood! House Rules Sleepy Dragon Hostel takes special requests – add in the next step! Sleepy Dragon Hostel accepts these cards and reserves the right to temporarily hold an amount prior to arrival. Please note that the credit card information provided during booking is for pre-authorization only. The hostel only accepts cash payment in TWD upon arrival. Please note that the front desk operates from 15:00 to 20:00. Guests who expect a later check-in than 20:00 are required to inform the hostel prior to the arrival date for self check-in information. Extra cost will be applied if guest checks in after 20:00 without prior approval. Arrivals after midnight are not acceptable. Please note that the hostel is nonsmoking throughout. A penalty charges may apply if smoking detected. I’ll be quick but to the point. I promise this will be one of the best hostel experiences in your life. There is nothing I would change there. Shelly is one of the friendliest most helpful people ever who made sure to give me such useful recommendations. I just simply loved staying there. 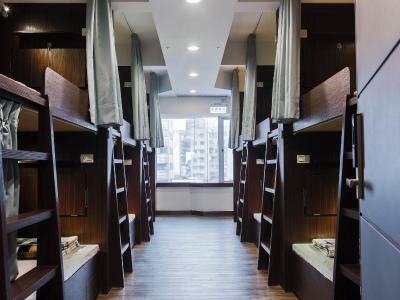 I wish every hostel was same as this one. There could be more power outlets for the beds. A bidet for the toilets would be great! Staff is amazing, cool place! We had bad luck with the people staying in our dorm, made a lot of noise, but this is not the hostel's fault of course! Expensive but totally worth it. Perfect place for long term stay, friendly staff, clean rooms, good showers, good WiFi, delicious breakfast and everyday something different! Common room is cosy! Close to public transport. The mattresses on the beds were a little too firm for my taste but it’s nothing major!! 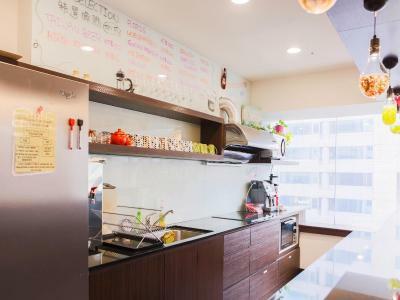 The hostel is located in a super convenient location with with Nanjin Sanmin station about a 10 mins walk. Along the walk to the station are several boba places (which was perfect for my friend and I!!) and restaurants. Also the Rahoe Night Market is about 10-15 mins away by walking!! They have the best donuts!! The ladies make them fresh!! The staff are the absolute highlight of the hostel. Extremely warm, welcoming and kind. They are super informative and helpful, be it advice for traveling to places and things to see, to helping you with laundry! They’re super awesome! Also, they make amazing breakfast!! Such a nice treat to wake up to in the morning. The hostel’s amenities are also awesome. The rooms are comfortable as are the beds. The mattresses were a little too firm for me personally, but regardless are comfortable!! The curtains block out all the light which is nice and the closet space is convenient too, with hangars. I definitely recommend staying at Sleep Dragon. You won’t regret it!! People working there are very kind. 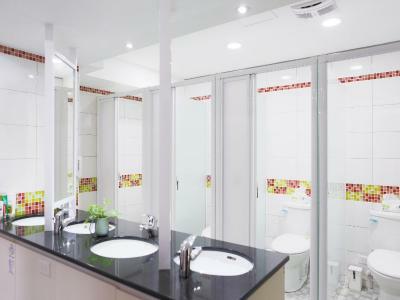 Comfortable bed room and clean bathroom. They make breakfast for you everyday. There is a cute cat. 1. Please put locks on the locker, because I wasn’t able to bring an extra padlock, good thing my luggage has its own padlock. Other than that, everything was ok. Just the padlock, and alcohol/sanitizer for the toilet bowl. 1. I love the lobby. It’s very presentable and clean. 2. They serve free breakfast there. Awesome! 3. The staff are professional and very helpful. 4. Complete information on how to do check in. 5. 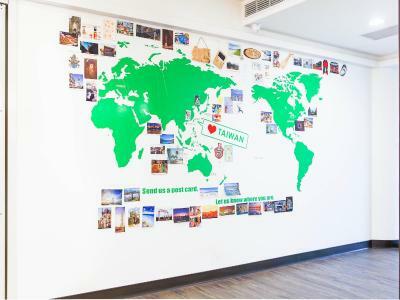 The hostel is very near the station (Nanjing Sanmin- green line) 6. 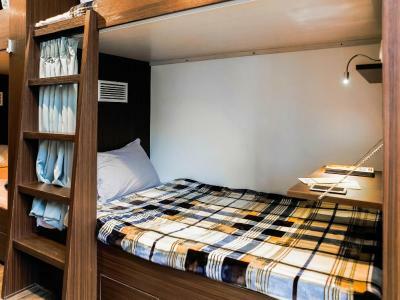 The bunk beds are clean, plus they have linens that you can use, and it’s really clean. 7. Very close to convenience stores and Watsons. 8. Near the major tourist spots. I highly recommend this hostel to my friends. Worth my stay, and my money. Big thumbs up to this hostel. Location, staff, rooms, service just fab! Have to pay for a towel; first place I'd been in a month of travel which did that. There's only 1 washer and dryer in the hostel, which is also used by the hostel for their laundry. There is a nearby laundrette (quite near an excellent dumpling place!). Stayed for 5 nights in total split over 2 stays. 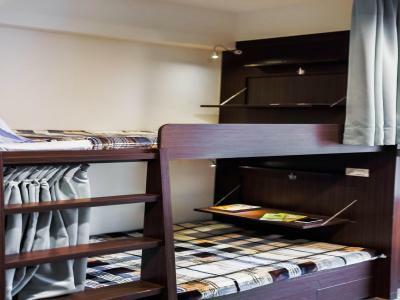 Friendly helpful staff and comfortable beds with large storage space. Kitchen space available and some essentials can be bought in hostel. Near the Songshan night market (and the temple which is worth a look). Taipei is pretty big though so not really near much else AFAIK. Comfy shared space, quite secure and cheap. Staff also let me leave my bag there for a couple of days whilst I was away (for a small fee). Free breakfast is also a nice bonus. - Men's toilet is outside the hotel. (But just three-step outside and private) - To lock your cabinet, you have to bring your own locker or ask to borrow from the staff (free of charge). - Bring your own towel or rent it.